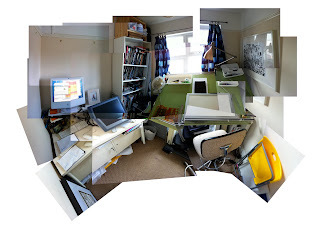 thought i'd do a quick studio tour of my box room, i mean studio! i set it up so you have a reference and prelims side and actual drawing side to the studio. Nearly all the prelim work is now done on my wacom cintiq (which is lovely). Its really freed up my creativity and I can try new things very quickly without printing out and enlarging photocopies. when i'm happy with it i print out the prelim page on my brother mfc-649ocw at full size then transfer it to board. i work very tight in prelims now and its really sped my productivity. Most of the equipment has been from ebay (even the cintiq), so if you look hard enough you can get some great bargains! I mainly use the Caran d'Ache Fixpencil 77 with either hb or h lead to transfer to the board depending on the paper. Lovely pencil with excellent balance!